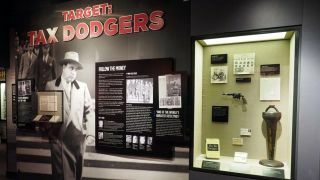 One of America’s top-ranked museums is entertaining and educating visitors better than ever, thanks to 10 Christie DWU555-GS laser phosphor projectors recently installed at numerous exhibits at the Mob Museum, located in Las Vegas. Opened in February 2012, in the former United States Post Office and Federal Courthouse, The Mob Museum: The National Museum of Organized Crime & Law Enforcement operates with a mission to advance the public understanding of organized crime's history and its influence on American society, complete with artifacts and interactive exhibits. Accredited by the American Alliance of Museums and listed on the National Register of Historic Places, the museum draws hundreds of thousands of visitors each year. “At the museum, we strive to provide a world-class experience to each of our guests,” said Ryan Markus, director of technology at the museum. “We are continually making improvements as we grow. I wanted everyone here at the museum to understand the quality difference from what we had before to what we are now getting with Christie. With its lampless technology, small footprint, low weight, quiet operation, and a full suite of lenses, the Christie DWU555-GS is also well suited for smaller location-based entertainment venues, boardrooms, higher education facilities, and houses of worship.